Please enter a valid Colorado zip code. Please enter a valid Colorado zip code. Fill your whole house with clean, consistent comfort. AccuClean is a whole house air cleaner, meaning it works in conjunction with your heating and cooling system to clean up to 99.98% of airborne allergens from filtered air in every room of your home. 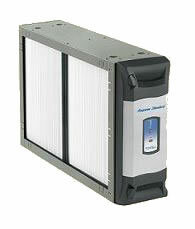 Compare this to plug-in air cleaners that operate in a single room. To match the effect of a whole house system, you'd have to buy several plug-in cleaners at a cost of $300 to $500 each. Even then, plug-ins are only effective within a certain radius, potentially leaving much of the air in the room unfiltered. Colorado Comfort heating and air conditioning contractor services include: furnace and heating repair, air conditioning and air conditioner repair, ac repair, heat pump repair, humidifier, thermostat, zoning, replacement and new installations. We service the Denver Metro area which includes Lakewood, Golden, Wheat Ridge, Arvada, Westminster, Thornton, Commerce City, Denver, Aurora, Centennial, Parker, Castle Rock, Highlands Ranch, Littleton, Englewood, Evergreen, Bailey, and Conifer. American Standard Heating & Air Conditioning is an international indoor and outdoor HVAC manufacturer, providing air handlers, heat pumps, heating systems, heater, furnaces, a/c, air conditioning, air conditioner, electronic air cleaners, energy recovery ventilators, and programmable thermostats. American Standard Heating & Air Conditioning also provides clean and affordable cooling and heating, humidifiers, indoor air quality and clean air systems. Efficiency. Reliability. Quality. That's what makes American Standard Heating & Air Conditioning. © 2012 CT Productions. All Rights Reserved. Colorado Comfort is a registered trademark of CT Productions.